I’ve never made zucchini flowers before, but I came across some particularly handsome specimens at a local farmer’s market and decided to give it a try. They’re not cheap, but they’re pretty cool looking and I’ve been curious about them for a while. All the recipes I’ve seen tend to stuff the zucchini flowers with a mixture of cheese and things, then tempura batter and fry it. This sounds delicious, but I hate frying at home, so I decided to simply sauté the zucchini flowers for an easier and healthier option. For the stuffing, the possibilities are endless. Just combine any mixture of cheese, garlic, shallots, herbs, etc. and it will be delicious. The peas were a nice touch to give the stuffing a little bit of bite and some nice springtime flavour. The morels on the side were a nice touch, and I basically included them because we are nearing the end of the season here in the Pacific Northwest. I’ll continue to incorporate my favourite mushroom any chance I get, and this recipe works! 1. 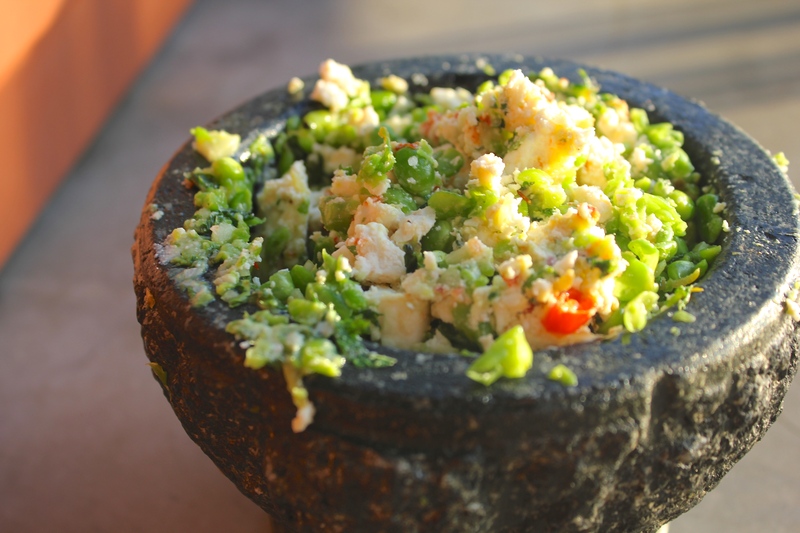 Combine the peas, lemon zest, half of the garlic, and a pinch of kosher salt in a mortar and pestle. Crush to make a rough paste. You still want some peas to remain more or less intact, but just beat up a little bit. Fold in the feta, mint, and chili to finish the stuffing. 2. Prepare the zucchini flowers by gently pulling away the petals to reveal what is apparently called the stigma (if you google “flower parts” like I did, it should come up as the first photo result). Cut off the stigma, because apparently it’s bitter. 3. To stuff the zucchini flowers, load up a good dollop on a small spoon. 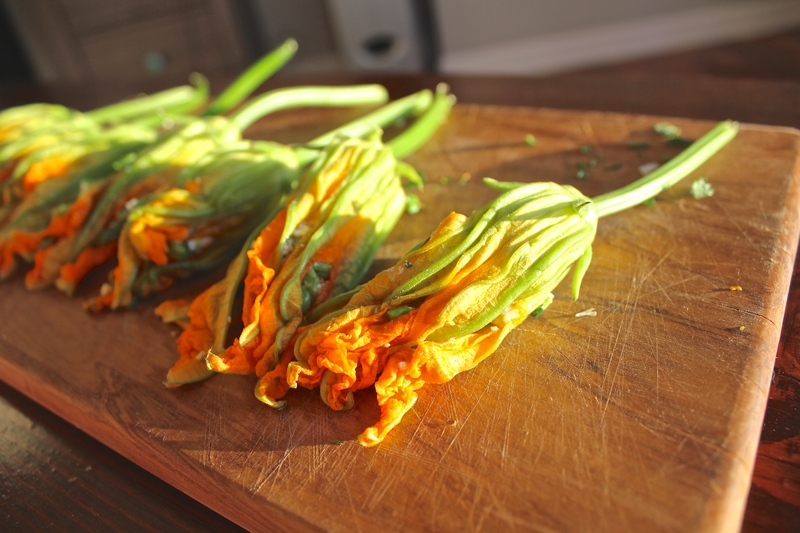 With the zucchini flower on its side, gently pull away the top two petals and slide the spoon into the cavity. Use your finger to push the feta and pea mixture into the flower, and then close up the flower petals around it. Set aside so that you can get the morels started. 4. Heat a large stainless steel or cast iron pan to high heat, wait for it to get smoking hot, then add the morels to the pan dry. Make sure they are spaced well apart. After five minutes, give the pan a little toss to move the mushrooms around, then add a glug of olive oil, the butter, and remaining garlic. Sauté for another five minutes, keeping the mushrooms moving around a bit. Remove from the pan and season, then set aside. 5. Add a little more olive oil to the same pan with the morels now removed, and return to medium high heat. 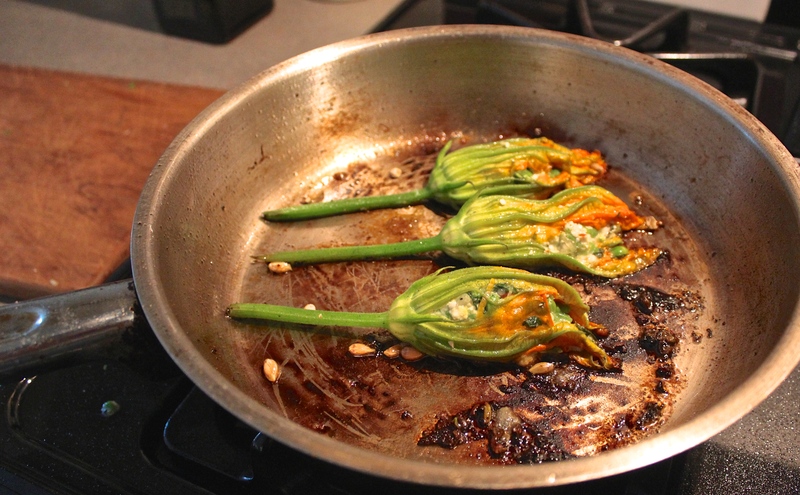 Delicately place the stuffed zucchini flowers in the hot pan and arrange so they are well spaced, you may need to work in batches. Cook on one side for 5-6 minutes undisturbed, then remove with a spatula. 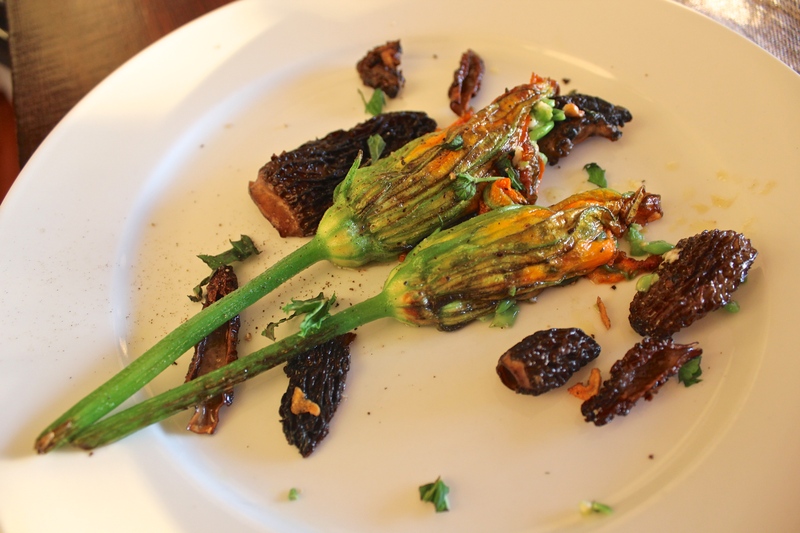 The stuffing will be barely contained by the zucchini flower at this point, so you’ll need show some finesse here. 6. 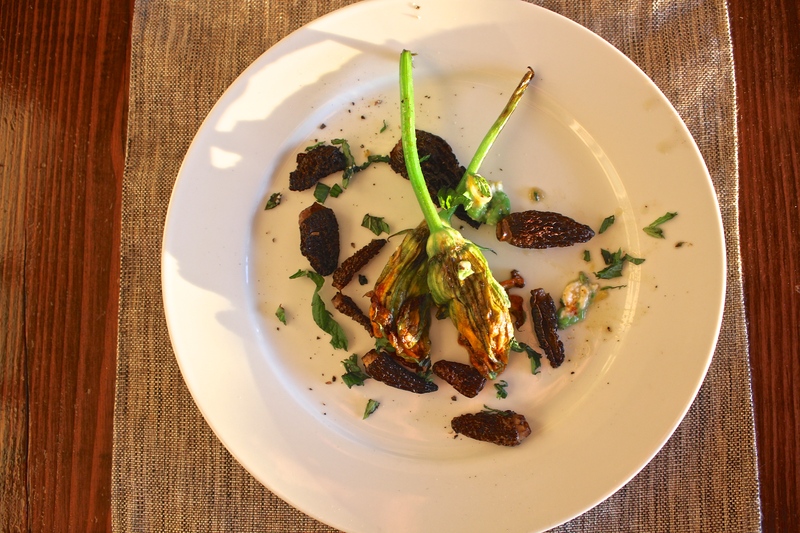 To plate, I just haphazardly threw the morels on a plate, arranged the zucchini flowers on top in a parallel or crossed arrangement, then sprinkled some extra chopped mint and cracked pepper. They are a remarkable thing, thank you so much for stopping by! P.S – can I join you to drink the wine? Who takes your photos? Such good pics! Laura, Katherine has all the talent in that department!